An internationally recognized expert on ancient Greek rhetoric provides the definitive history and analysis of the oratory of praise and its social function in the Greco-Roman world. Speeches of praise and blame constituted a form of oratory put to brilliant and creative use in the classical Greek period (fifth to fourth century BC) and the Roman imperial period (first to fourth century AD), and they have influenced public speakers through all the succeeding ages. Yet unlike the other classical genres of rhetoric, epideictic rhetoric remains something of a mystery. It was the least important genre at the start of Greek oratory, but its role grew exponentially in subsequent periods, even though epideictic orations were not meant to elicit any action on the part of the listener, as judicial and deliberative speeches attempted to do. So why did the ancients value the oratory of praise so highly? 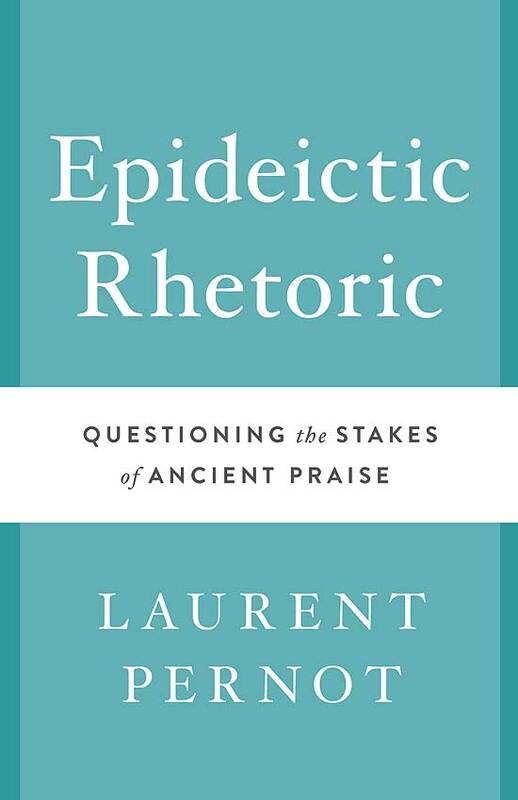 In Epideictic Rhetoric, Laurent Pernot offers an authoritative overview of the genre that surveys its history in ancient Greece and Rome, its technical aspects, and its social function. He begins by defining epideictic rhetoric and tracing its evolution from its first realizations in classical Greece to its eloquent triumph in the Greco-Roman world. No longer were speeches limited to tribunals, assemblies, and courts—they now involved ceremonies as well, which changed the political and social implications of public speaking. Pernot analyzes the techniques of praise, both as stipulated by theoreticians and as practiced by orators. He describes how epideictic rhetoric functioned to give shape to the representations and common beliefs of a group, render explicit and justify accepted values, and offer lessons on new values. Finally, Pernot incorporates current research about rhetoric into the analysis of praise. Laurent Pernot is Professor and Chair of the Department of Greek at the University of Strasbourg, Director of the Center for the Analysis of the Religious Rhetorics of Antiquity, Member of the Institut de France (Académie des Inscriptions et Belles-Lettres), and former President of the International Society for the History of Rhetoric (ISHR). His many publications include Rhetoric in Antiquity and New Chapters in the History of Rhetoric . This [sc. epideictic oratory] is a form of literature which has relatively few admirers today, but if we are to understand the Greeks thoroughly it seems necessary to understand, if not to share, their love for it. I have done a lot of work on epideictic throughout my life, from a two-volume book in French entitled La rhétorique de l’ éloge dans le monde gréco-romain (The rhetoric of praise in the Greco-Roman world) to more recent papers. Yet I must confess that after decades of research, this topic still seems to possess diﬃcult and puzzling aspects. Everyone who studies this material knows that epideictic oratory represents in theory a third of all rhetoric (epideictic is one of three genres, along with judicial or forensic rhetoric and deliberative rhetoric). Scholars of rhetoric also know that epideictic oratory includes speeches of praise and blame, which are an important feature of practical speaking. But as soon as one moves beyond these elementary observations, questions arise, two in particular: one relates to the history of epideictic rhetoric, and the other to its function. From the historical point of view, epideictic developed differently from the two other genres. It was the least important of the three at the beginning of Greek oratory, but its role grew exponentially in subsequent periods. This historical development, which could not have been predicted, deserves an explanation. At the same time, while epideictic is important, its role remains unclear. Unlike judicial and deliberative speeches, epideictic orations are not meant to elicit any vote or any decision on the part of the listener. From a functional point of view, one is right to wonder what use they were. Furthermore, in ancient and modern languages, “epideictic rhetoric” corresponds to a plurality of terms, a situation which may create confusion: for example, in English, we have “praise,” “eulogy,” “encomium,” and “panegyric.” Thus, “epideictic” raises some interpretative diﬃculties. It is therefore necessary to clarify, and to understand, this concept. The present book is intended to propose some answers; its focus is Greco-Roman antiquity, but the hope is that certain observations will be transferable to other periods, at least in part, and can contribute to the interpretation of epideictic in medieval, modern, and contemporary contexts. The Greek Classical period (ﬁfth to fourth century BC) and the Roman Imperial period (ﬁrst to fourth century AD) were brilliant and creative times in the history of epideictic rhetoric, and this is the reason they deserve our attention. Today there is a growing interest in this ﬁeld. Several studies published in recent decades, each adopting diﬀerent methods and subjects, show a tendency to take the function of epideictic speeches seriously, for example, concerning classical Greek funeral oration (Loraux 1986), the Latin panegyrics (MacCormack 1981), and Greek rhetoric of the fourth century AD and the Byzantine period (Kennedy 1983). Some recent collections of papers deal with both general issues (Urso 2011) and circumscribed corpora (Rees 2012; Roche 2011; Smith and Covino 2010). The concept of “epideictic” plays a central part in J. Walker’s Rhetoric and Poetics in Antiquity (2000). This important work transcends the boundaries between rhetoric and poetry and proposes an in-depth analysis of the functions of literature. Although Walker’s approach is basically diﬀerent from that of the present book, there is substantial compatibility, I think, between the two arguments, insofar as epideictic is recognized by both as a major phenomenon and a source of oral and written creativity. The sources available for our investigation are spread over several categories. They include theoretical treatises (Aristotle, Cicero, Quintilian, Menander Rhetor, and others); oratory practice (including Isocrates, Latin panegyrics); testimonies about lost works, for example, Philostratus’ Lives of the Sophists and references in the Byzantine encyclopedia entitled Suda; reﬂections on praise in a wide range of literary, historical, and philosophical works (Plato and Lucian, among others); inscriptions; and papyri. In addition to their chronological and geographical range, these sources are characterized by their diversity, as they comprise actual speeches as well as speculative and documentary texts. The history of epideictic rhetoric extends to both oratorical productions (and their relationship with society, usage, and institutions) and reﬂexive and conceptual elaboration, which took place in teaching, in theoreticians’ research, and in philosophers’ discussions. Any study must confront this methodological plurality in order to resituate the object within its own multiple territories—because every encomium is at once a literary work, a moral problem, and a social rite. Our initial aim will be to establish rhetorical praise as a historical object, by deﬁning it, by describing it in its context, and by retracing its evolution. This is the purpose of the ﬁrst chapter, which marks out the stages of the development of the prose encomium, and of its crystallization as a rhetorical genre, from its ﬁrst realizations in Classical Greece to the triumph of epideictic eloquence in the Greco-Roman world. This mutation meant the establishment of a new global rhetorical order in which public speaking was no longer limited to the tribunals and the assemblies, but also had a place in ceremonies. Repositioned in its historical context, this mutation reveals its political and social causes. Chapter 2 analyzes the technique of praise, as stipulated by the theoreticians and used by the orators: the “commonplaces” (topoi) and their meaning, the diﬀerent types of speeches, and the tropes and ﬁgures of style. The interest of this technique goes well beyond technical processes. It belongs to intellectual and cultural history, what French scholars called a “history of mentalities” (histoire des mentalités), as it reﬂects the wider mind-sets of educated groups for long durations of time. The third chapter discusses the role of the technique and the tensions that praise can carry. It is necessary to assess the critiques leveled at encomia in antiquity, notably by the philosophers, in order to propose a global interpretation of this oratory form and explain the reasons for its success. Such balance can be achieved by examining the missions assigned to the epideictic orators, the function their words fulﬁlled, and the messages they delivered. Certain questions about the function of epideictic speeches must be posed in sociological terms. Epideictic rhetoric’s chief function is a social one. It gives a shape to the representations and common beliefs of the group; it renders explicit, and justiﬁes, accepted values; and on occasion it even oﬀers lessons in new values. The topic of epideictic rhetoric has yet to beneﬁt from all the progress of current research on rhetoric. In the ﬁnal chapter we indicate some paths for interpretation: what the speeches leave unspoken (hidden messages, idiosyncratic positions, veiled criticisms); a psychopathology of encomium (envy, ﬂattery, disgust); religious epideictic (hymn, etc. ); and comparative epideictic.